Within the Azure Platform, there is a set of services named .NET Services. These set of services were originally known as BizTalk.NET, and it includes the Workflow Services, the Access Control Services, and the one we will talk about, the Service Bus. 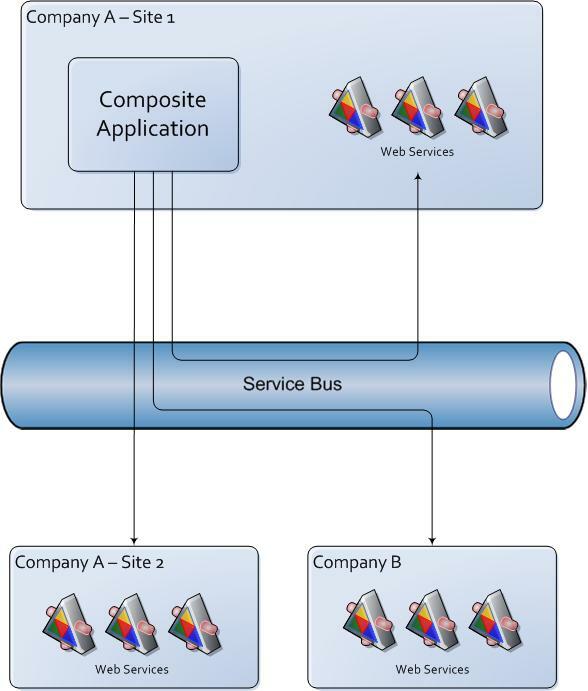 The Service Bus implements the familiar Enterprise Service Bus Pattern. In a nutshell, the service bus allows for service location unawareness between the service and its consumer, along with a set of other, rather important, capabilities. 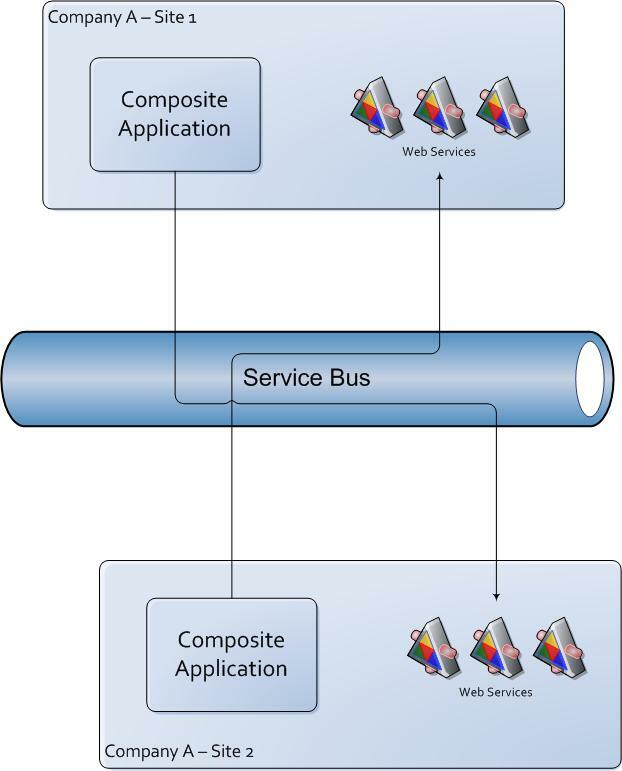 The Service Bus allows you to build composite applications based on services that you really do not need to know where they are. They could be in servers inside your company, or on a server on the other side of the world; the location is irrelevant. There are, nevertheless, important things you need to know about the service you are calling, namely, security. The Access Control Service integrates seamlessly with the Service Bus to provide authentication and authorization. The Access Control Service will be addressed in some other entry, for now we are concentrating on the Service Bus. 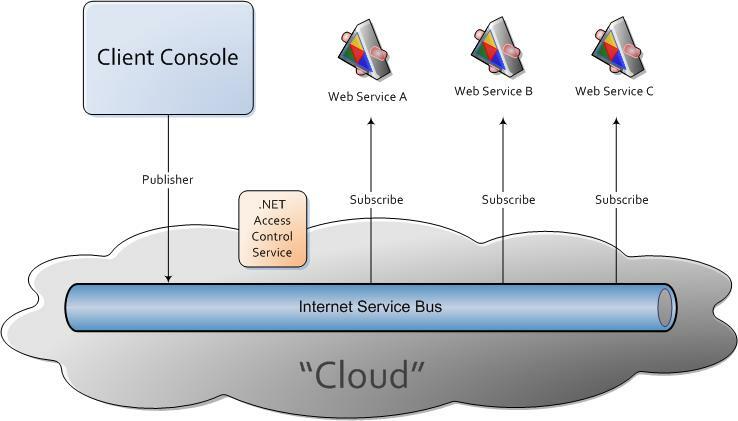 The following diagrams depict different scenarios where it makes sense to use the Service Bus. Depending on the Service Bus location, it can take a slightly different designation. 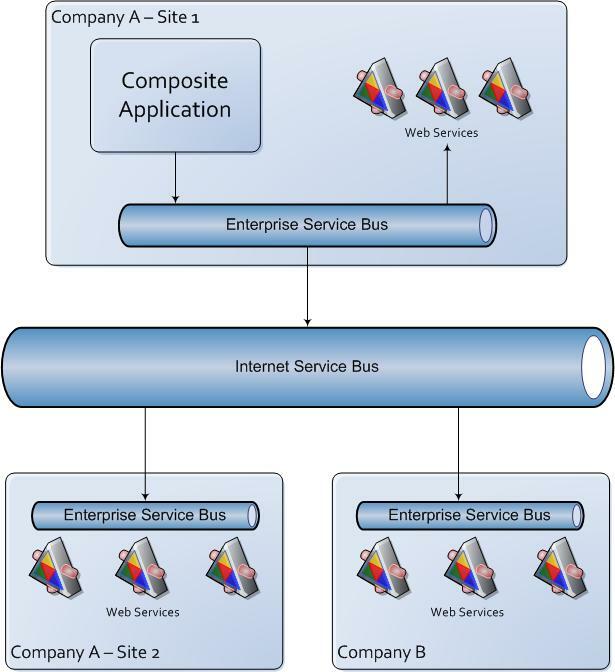 If the Service Bus is installed and working on-premises, it is commonly known as an ESB (Enterprise Service Bus), if it is on the cloud, it takes the designation ISB (Internet Service Bus). It is still not clear what Microsoft´s intentions are regarding an on-premises offering of the Azure Platform. The following diagram shows another possible scenario for using the Service Bus. As I mentioned before, there are several other benefits associated with the use of the Service Bus that can be leveraged by the configuration shown in this diagram. For instance, the Service Bus also provides protocol mediation allowing use of non-standard bindings inside the enterprise (e.g., NetTcpBinding), and more standard protocols once a request is forwarded to the cloud (e.g., BasicHttpBinding). Going back to our example, we are going to setup the publisher/subscriber scenario depicted in the following diagram. 2) Create a solution in the Azure Services Platform Portal. 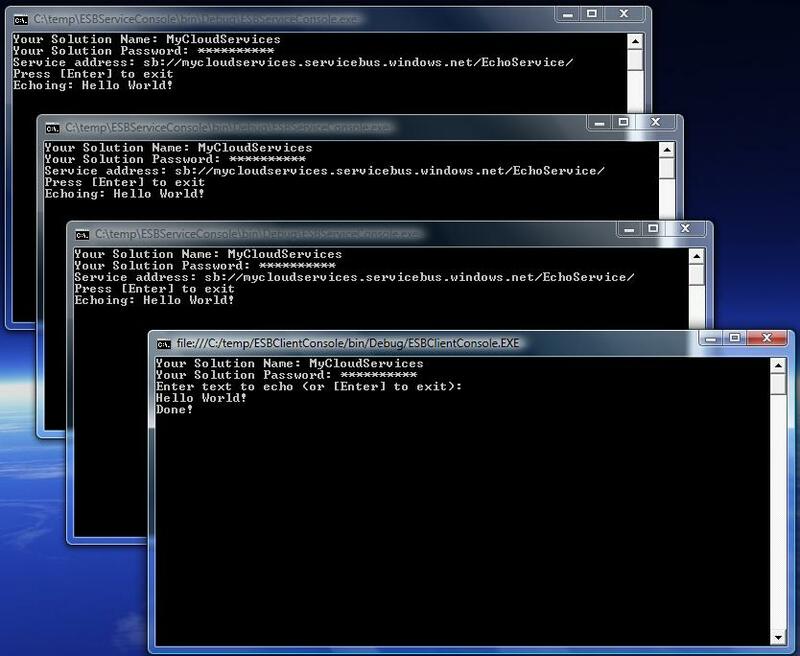 This solution will create an account issued by the Access Control Service (accesscontrol.windows.net). The Access Control Service creates this account for convenience only, and this is going to be deprecated. The Access Control Service is basically an STS (Security Token Service), there is no intention from Microsoft to build yet another Identity Management System. Although it integrates with Identity Management Systems such as Windows CardSpace, Windows Live Id, Active Directory Federation Services, etc. // read the solution credentials to connect to the Service Bus. this type of credentials are going to be deprecated, they just exist for convenience, in a real scenario one should use CardSpace, Certificates, Live Services Id, etc. Notice that I chose the Tcp protocol as the connectivity mode. In the client side, I will specify the Http protocol. This is to show that protocol mediation can be accomplished with the use of the Service Bus. Now let´s build a client application. 1) Add a console project named “ESBClientConsole” to the solution. 2) Add a reference to the “System.ServiceModel” assembly. 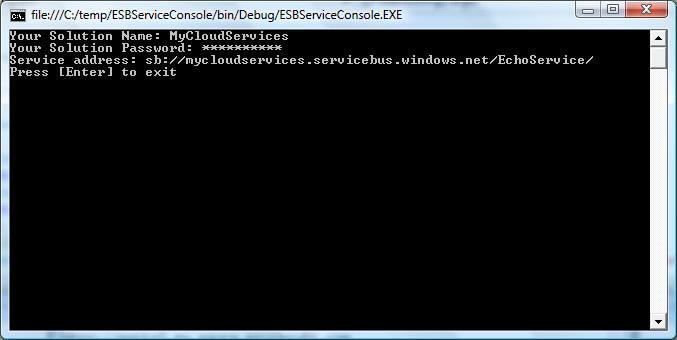 3) Add a reference to the “Microsoft.ServiceBus” assembly. 8) Compile the client, run three instances of the service, enter the credentials, run the client and type some text, the result should be as follows. There you have it, a publish/subscribe example using the Service Bus.